Goat Rocks Wilderness, Gifford Pinchot National Forest. Public domain image courtesy of the U.S. Forest Service. Although I am, in many ways, a Luddite at heart, I’ve become aware recently that I spend altogether too much time hopscotching across the internet, searching for news. I am also a news junkie, you see, and the interesting times we live in have had me riveted to my screen. However, I’ve also noticed that too much screen time makes me feel grumpy and my brain feel sluggish and scattered. So, I’ve been making a concerted effort lately to set aside the tablet and pick up a book, to spend more time wandering in the place of deeper contemplation that opens up for me when I am really reading. And perhaps it is no coincidence that the common thread of solitude (the antidote to a clickbait crazy world?) has run through several of the books I’ve picked up lately. Michael Finkel’s The Stranger in the Woods: The Extraordinary Story of the Last True Hermit, which chronicles Christopher Knight’s 27-year sojourn with solitude in the Maine woods, pushed this thread to its furthest extreme. (Sidenote: I inadvertently placed my hold on the large print edition, and found the reading experience surprisingly pleasant. Fellow Gen-Xers, I’m here to tell you that there is no shame in loving large print.) Finkel provides a fascinating look not only at Knight, but also at the various traditions of hermitry that have speckled human history. 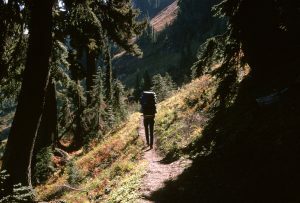 While Christopher Knight withdrew from society to escape it completely, Cheryl Strayed’s search for solitude on the Pacific Crest Trail, chronicled in Wild: From Lost to Found on the Pacific Crest Trail, sprang from her desire to reconfigure her relationships, with herself and with others. Strayed’s desolation over her mother’s death, and the subsequent unraveling of her family and her marriage, had made her desperate for a reboot. Strayed’s account offers the wilderness as crucible, and as solace, and while she meets and befriends other hikers on the trail, it is by facing hardship in solitude that she earns her redemption. Lynn Darling’s Out of the Woods: A Memoir of Wayfinding takes the art of navigation as its device. Darling, long widowed and recent empty-nester, leaves New York City for the solitude of a timeworn house deep in the woods of Vermont. In the spirit of getting lost and finding your way, Darling’s book, which chronicles her battle with cancer in the midst of her midlife crossroads, points out the humility and frank self-assessment– both possible side effects of time spent lost in the woods–required to successfully navigate the tricky bits. -Melissa Fisher Isaacs is the Information Services Coordinator at Lawrence Public Library.